Product #6314 | SKU ZP-400E-00DB | 0.0 (no ratings yet) Thanks for your rating! 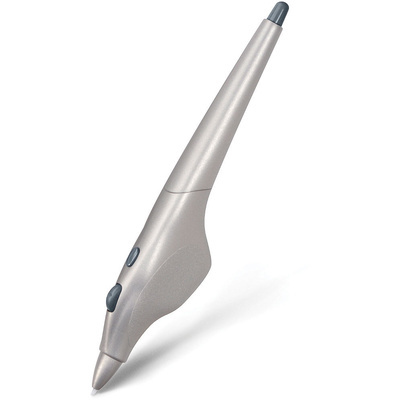 The Wacom Digital Airbrush Pen for the Intuos3 Series and the older generation Cintiq21UX Tablet provides users with the feel of a traditional airbrush while using a digital tablet. This is particularly useful for artists transitioning from traditional Airbrush work to a digital work process. This cordless, battery-free, Digital Airbrush features a top-mounted fingerwheel, pressure-sensitive tip and eraser, and one programmable button. This stylus will work on the Intuos3, the older generation Cintiq 21UX (mfr# DTZ2100), Cintiq 20WSX, and Cintiq 12WX tablets only. It will not work on the Intuos4 or the newer generation Cintiq 21UX (mfr# DTK2100).